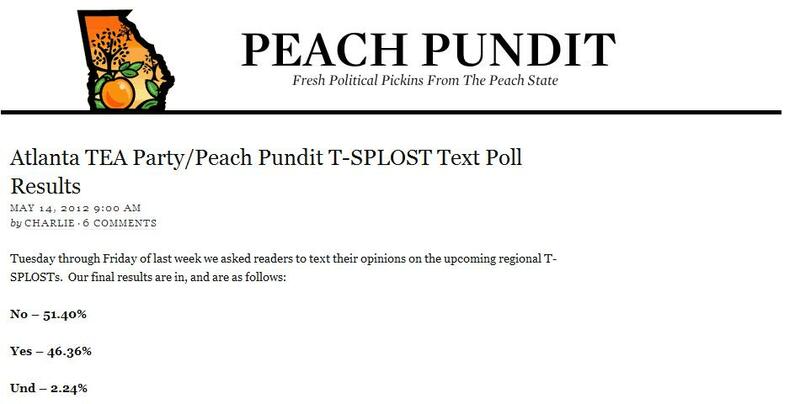 As an interesting display of PolitiKlout's texting solutions, PeachPundit.com and the Atlanta Tea Party Patriots ran a poll on the upcoming Atlanta Regional T-SPLOST set for the July 31st Primary. As Peach Pundit recently reported, the results are in! The strong turnout is no surprise when you consider that nearly 300 million Americans have cell phones (about 94 percent of the total U.S. population) and send about 4.3 billion text messages every day, according to the Washington-based trade group, CTIA-The Wireless Association. About 26% of American adults have used their cell phones for political purposes in 2010. It appears the interest in political texting has local interest here in Georgia as well. 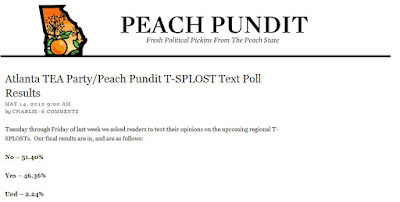 The initial post announcing the T-SPLOST poll on Peach Pundit attracted 52 comments (the second-most discussed thread on that site in the month of May). What's clear is that there is both interest in the subject matter and the method of polling. But issue polling is just one example of what texting brings to the table when it comes to political issues and campaigns --- keeping in mind that text messaging campaigns are bipartition. In fact, it is this opt-in nature of text message outreach that leaves many campaigns uncertain. But it needn't be. In 2008, President Obama built a list of 3.3-million contacts simply by asking people to opt-in when they attended events and by asking people to opt-in to be the first to know whom his vice presidential nominee would be. Sadly, someone leaked it to the press shorty before it was announced via text message, taking away some of the impact. Still, the engagement was there. And political use of texting didn't stop in 2008, and it doesn't look to slow down any time soon. U.S. Rep. Roy Blunt put “Text JOBS to Blunt” on his campaign RV. Meg Whitman, candidate for California Governor, had a text-message trivia contest where she asked which California college baseball team had won the most College World Series wins. If you entered the contest, you could win a "Whitman for Governor" baseball cap. Senator Scott Brown sent out a text message to his supporters minutes before his opponent was going on the air for a talk radio show, essentially probing his base into action in a very public way. Text messaging is just one of the services PolitiKlout offers to help political campaigns. If you would like more information about our other service offers, please visit www.PolitiKlout.com. ©PolitiKlout LLC. Simple theme. Powered by Blogger.